A professional mathematician by training, John Lennox has become known in the evangelical world for his often-insightful critiques of evolutionary theory. Both his lecturing and his writing are engaging, and that’s true of his book Determined to Believe? : The Sovereignty of God, Freedom, Faith, and Human Responsibility, too. It will bring great comfort to many in the Arminian tradition; it’s hard to imagine how it could convince many well-informed readers in the Reformed tradition, which he commonly labels “theological determinism.” Lennox opposes two kinds of determinism—the physical determinism adopted by many atheists who have bought into philosophical naturalism, and theological determinism that, he fears, is on the rise, and that attracts most of his focused refutation in this work. Zondervan (2018). 386 pp. $19.99. Determined to Believe? is written for those who are interested in or even troubled by questions about God’s sovereignty and human freedom and responsibility. John Lennox writes in the spirit of helping people to come to grips with the biblical treatment of this issue for themselves. Lennox divides his book into five parts scattered across 20 chapters and an epilogue. In the first, “The Problem Defined,” Lennox argues that “true freedom” is part of the gospel’s “core message.” The freedom he espouses, with little defense, is libertarian freedom. 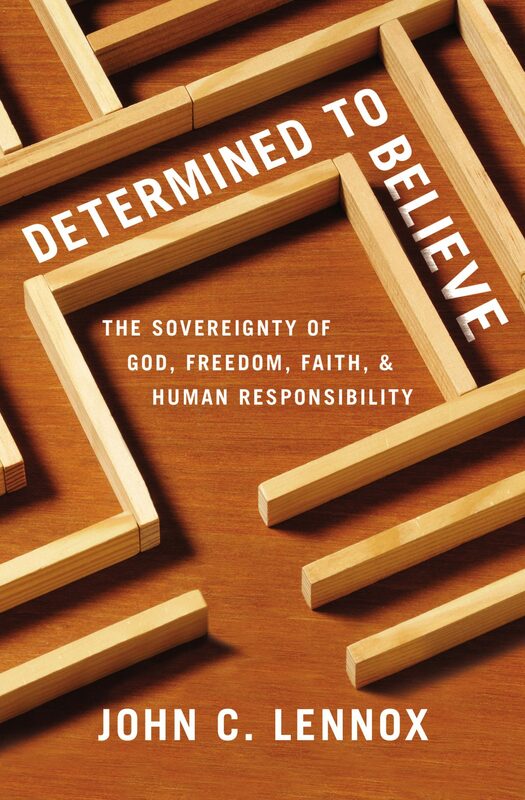 Lennox acknowledges different kinds of determinism (but comes nowhere near what a Reformed theologian would say), insists that the issue isn’t whether God is truly sovereign, but what divine sovereignty means. The “moral problem” of determinism fastens, for Lennox, on Auschwitz: he avers that he couldn’t believe in a God who in any real sense ordains such suffering. As further historical background, Lennox lightly covers the debates that led to the Synod of Dort and TULIP. Lennox rounds up this section with his fourth chapter, “Weapons of Mass Distraction.” Here he excoriates the use of labels to identify various theological positions, instead of paying attention to what the Bible actually says. He has a point, though it’s more than a little troubling that all the bad examples he identifies are on one side. The second part of the book treats “The Theology of Determinism,” with chapter 5 devoted to “God’s Sovereignty and Human Responsibility,” and chapter 6 to “The Biblical Vocabulary” (foreknowledge, predestination, election). In chapter 5, Lennox’s goal is to show that the Bible teaches both God’s sovereignty and also human responsibility. In some general sense, that’s exactly right—yet the devil is in the details. It’s hard not to see that although Lennox formally espouses both, in his actual handling of texts he consistently trims the former by appeal to the latter. What he defends isn’t a solid commitment to divine sovereignty and to human responsibility, but a solid commitment to domesticated divine sovereignty and a form of human responsibility that presupposes a libertarian view of freedom. For example, on page 93 Lennox quotes the words of Peter about Jesus: “This man was handed over to you by God’s set purpose and foreknowledge; and you, with the help of wicked men, put him to death by nailing him to the cross” (Acts 2:33). Lennox comments, “The crucifixion was therefore foreknown by God and occurred according to his set purpose; and yet the men who put him to death were wicked and therefore morally responsible” (93). So far, so good. Perhaps the more telling passage in Acts is a pair of verses in chapter 4: “Indeed Herod and Pontius Pilate met together with the Gentiles and the people of Israel in this city to conspire against your holy servant Jesus, whom you anointed” (4:27), followed by: “They did what your power and will had decided beforehand should happen” (4:28). So there, in the strongest form, you have the tension between human responsibility (4:27) and God’s sovereignty (4:28). It’s important to see that we need the truth expressed in both verses if the Christian gospel is to be preserved. Suppose we uphold v. 27 but deny v. 28: what follows? If we ask the question, “Why did Jesus die?” the answer, on the assumption that v. 27 is true and that v. 28 doesn’t exist, is that Jesus died as a result of a cheap political conspiracy among various parties in Jerusalem, Jews and Gentiles alike. He did not die as a result of God’s plan and purpose—a conclusion that would be devastating for the gospel, and in any case would make nonsense of the many biblical trajectories that run through the Scriptures and climax in the cross (e.g., Passover, the Day of Atonement, various sin offerings, the suffering servant). Conversely, suppose we uphold v. 28 but deny v. 27: what follows? We would need to say that Jesus died as a result of God’s power and will; it was the result of his decision, taken in advance. Jesus did not die as a result of evil human machinations. But if there’s no human evil in the events that take Jesus to the cross, where is there evil? If there’s no evil, why on earth do we need an atonement in the first place? In Acts 4:27–28 we find a superb example of simultaneous commitment to the reality of human responsibility and the reality of divine sovereignty. So in Acts 4:27–28 we find a superb example of simultaneous commitment to the reality of human responsibility and the reality of divine sovereignty. To believe that both of these realities are taught and exemplified in Scripture is to believe that, however challenging the concept, they’re mutually compatible, and the person who accepts Scripture’s witness on the matter is a compatibilist. But Lennox will have none of it. He adopts four strategies against such a conclusion. First, he never addresses this pair of verses, and a number of other passages (as we shall see), that seem to offer the clearest case for a strong belief in both divine sovereignty and human responsibility. Second, when he comments on Acts 4:28, it’s not in his fifth chapter, where his topic is divine sovereignty and human responsibility, but in his sixth, where he considers “the biblical vocabulary”: such words as foreknowledge, predestination, election, and so forth. Foreknowledge, in Lennox’s view, is never causative; indeed, he adopts, without discussion, the “middle knowledge” view propounded by the Spanish Jesuit Molina. In the same chapter, Lennox lists Acts 4:28 as one of the passages that uses the verb “to predestinate”—or, as the NIV renders it in this text, “They did what your power and will had decided beforehand should happen.” But the total range of topics constrained by this verb in the New Testament is small, he says, so it can’t be made to apply to everything that happens. So by focusing on his brief word studies, he sidesteps the exegesis of the passages at issue. In the context, what God predestines in Acts 4:28 (what he decides beforehand should happen) is everything that the conspirators of 4:27 stipulate. Word studies, especially poorly executed word studies, can’t substitute for detailed exegesis of entire texts. Still, Lennox almost gets it right: “the Bible itself [he says] does not regard God’s foreknowledge or predestination as diminishing human responsibility” (108, emphasis his), which is exactly right: it sounds as if Lennox is on the cusp of espousing compatibilism after all. But then, precisely because Lennox ties human responsibility to a libertarian notion of will, he must say that human responsibility diminishes God’s foreknowledge and predestination. Again, he observes that the betrayal of Jesus was “predestined” (Luke 22:22), that Jesus pronounces his “woe” upon the betrayer. “This is clearly implying that the betrayer was morally culpable and therefore accountable. Once again the implication of this is that, however we understand the terms, we may not interpret them in such a way that they negate human moral responsibility” (109). Well said; indeed, I do not know a single person in the Reformed tradition who would disagree, so I’m not certain who Lennox’s target is in this passage. But nowhere does he articulate and espouse the reciprocal truth that, however we understand the Bible’s many articulations of human moral responsibility, we may not interpret them in such a way that they negate God’s sovereign predestination. Once again, Lennox defends not a solid commitment to divine sovereignty and to human responsibility, but a solid commitment to domesticated divine sovereignty and a form of human responsibility that presupposes a libertarian view of freedom. There’s no exegetically responsible way of avoiding the simultaneous realities of God’s robust sovereignty and human moral responsibility. Third, otherwise put, Lennox distances himself from compatibilism. More precisely, he aligns himself with the discussion of Tom McCall on compatibilism (see his An Invitation to Analytic Christian Theology [Downers Grove: IVP, 2015]), whose treatment of compatibilism is in line with that of much contemporary philosophy, and is essentially a mechanistic analysis. And fourth, Lennox devotes no space to the numerous passages where a robust compatibilism is exegetically unavoidable (e.g., Gen. 50:19–20; Isa. 10:5ff.). I contend there’s no exegetically responsible way of avoiding the simultaneous realities of God’s robust sovereignty and human moral responsibility. In the third part of his book Lennox devotes five chapters to the gospel and determinism. A good deal of space is devoted to refuting much of the so-called “five points” of Dort—except, of course, for what is often called eternal security. Much of these chapters reflects the proof-texting of much of popular conservative evangelicalism. Part 4 is devoted to “Israel and Determinism” (chs. 12–16); part 5 to “Assurance and determinism” (chs. 17–20). Much of the fourth part aims to expound substantial parts of Romans 9–11. Despite many good points, the handling of these chapters seems frequently to be rather forced. To respond even briefly to these three final parts of Lennox’s book, I would have to double or triple the length of a review already too lengthy. Perhaps I might restrict myself to two final observations. First, this book is simply written and therefore easy to follow. Part of this simplicity is tied to the reductionistic handling of not a few arguments, but part of it is the author’s attractive style, doubtless the fruit of years of popular speaking in highly diverse contexts. Second, Lennox has overlooked one of the most important axioms of serious polemical theology. If you aim to win over as many opponents as possible, you must prove yourself capable of understanding and articulating that opponent’s position at least as knowledgeably and convincingly as he or she—and only then refute it. If instead few of your opponents recognize their position in your description (caricature?) of it, you’re unlikely to gain a respectful hearing from those who, on your assumptions, must need it. On this front, I fear, the book is a bit of a disappointment. The result is that the book will bring solace to those already onside with the author, and may win some who have never wrestled deeply with the arguments. But I suspect it will be unable to win over many from the camp Lennox seeks to refute. Perhaps that was not his aim anyway.